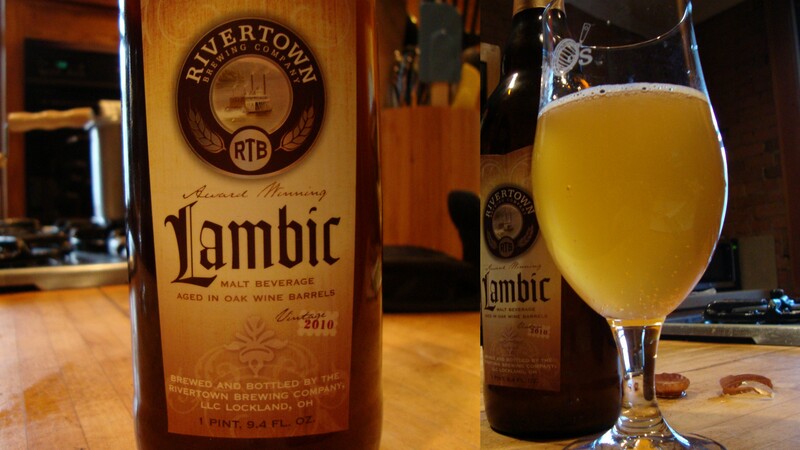 For the longest time, I was unnecessarily skeptical about buying Rivertown’s Lambic. I’ve found many of their beers hit-or-miss in the past, and dropping $15 or so on a hard to get right beer style that a brewery has never brewed commercially before didn’t sound like a great idea. Then the opinions, many from people whose opinion on beer I highly respect, started rolling in. These ranged from “good for a beer brewed in Cincinnati” (from those loath to believe that a non-boring, good-tasting beer can be brewed here) to just plain “good”. I didn’t hear any complaints about it at all, which might be the first, in my experience, for a local beer. Then the Beer Advocate review came out. There had been a number of generally positive user reviews of Rivertown Lambic on the site, but until a recent issue of the magazine arrived at my door, the verdict was out on what the founders of Beer Advocate thought. To I think everyone’s, except the brewers and those who have tried it before’s, surprise, they scored it a remarkable 94/100. Seeing that, I knew I had to track down a bottle and ended up doing so, finding what has to be one of the last bottles in the Cincinnati-area still on the shelves. The lambic pours a hazy, yet still bright, straw color. This is largely because it is (appropriately) unfiltered, so the yeast and other sediments never quite settle. Because it’s unfiltered, you also will want to take care to leave the “dregs” at the bottom of the bottle so as to avoid filling your glass with it. The head was a brilliant white, but was smaller than I’m used to seeing on a young lambic and it dissipated quite quickly. The nose is that of your classic lambics: “funk”, citrus, oak, with a small bit of graininess and a touch of earthy must. The taste is tart, but not too sour yet. I’d like to see how puckering it is once it gets a few years on it, but at less than a year on the shelves, it still needs a little time to let the residual yeast keep working its magic in the bottle. Other than the tartness, the flavors are lemon zest and a bit of fruitiness, backed by an oakiness which helps dry out some of the sweetness than aging will take care of. The body is light, with medium-high crisp, refreshing carbonation that I was concerned wouldn’t be there since the head was so weak on the initial pour. Overall, Rivertown Lambic far surpassed my expectations. Almost all of the issues I had with it, outside of the weak head, can be dealt with by hanging onto the bottle for a year or two. For a first release of its type from the brewery, this is a heck of a beer. While it obviously doesn’t measure up to Cantillon, Drie Fonteinen, etc., I wouldn’t expect it to. It does, however, beat out most other commonly available lambics at the same price point, which is a heck of a feat for a relatively new brewery. If you can still find the 2010 bottles or if you’d like to wait until 2011 ones are released, you need to give this local option a try if you’re a fan of sour/wild ales. Wild and “sour” ales have been all the rage in the past year or so, with adventurous brewers adding Brettanomyces (one of the yeast strains that can help make a beer funky and tart) to every beer style under the sun. Between this lambic, Pestilence (review upcoming), and the few new sour beers (1, 2) that Rivertown will be releasing in the next year, it’s cool to see a local brewer jumping into the mix and trying their hands at some creative beers that go beyond the traditional to-the-style European-based beers that Cincinnati-area brewers seem so in love with. I, for one, will definitely be picking up anything new and exciting that Rivertown decides to release in the future. Previous Previous post: Nominate Cincinnati for BeerCity USA by April 21st!